Yesterday at work we made hamburgers with Krispy Kreme donuts as the buns. I don’t know why. These things just happen. One minute you’re talking about chocolate-covered bacon and the next you’re daring your boss to cut off two years of his life in two Krispy, greasy bites. A lot of supplies are required to make donut burgers: a griddle, glazed donuts, ground beef, bacon, cheese, eggs and of course lettuce and tomatoes. Don’t forget your veggies! If you ever make these at your own workplace, a fried egg works well to cover up the donut hole. Don’t forget to toast your donut on the griddle for extra crispiness! But have thick plates and lots of paper towels because these are prone to drip. I myself did not have a donut burger because the day before that we had frosted carrots for my birthday. See? 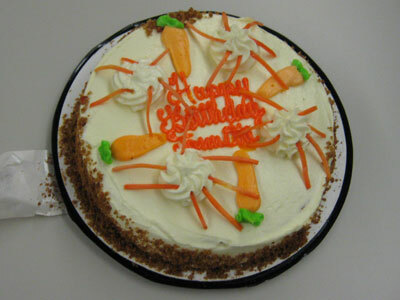 There are twenty-eight carrot flakes on top of a carrot cake, and they even spelled my name right. My coworkers are awesome. I’m going to miss them when they all have coronaries. Laughing myself to death. DONUT BURGERS?? With EGGS? Oh, my gosh yes please inlcude vegetables. Oh sweet fancy Moses. Those burgers remind me of the bizarre concoctions I’d make in the kitchen when I was a kid . . . that I’d then force others to eat. Oh dear God…that first pic looks like the kind of stuff we used to come up with with four guys in a duplex in college. Wow. What I think is funny is the lab-like environment in which you did the experiment. I think the donut burger sounds icky, but it seems like you have a lot of fun at work. p.s. happy birthday! One more pic for your history of cake. It looks like a variation of “the Luther” (yes, named after Luther Vandross). This was shown on the Boondocks cartoon. Like you indicated, many people had coronaries in this episode. Oh. My. God. That scares me and I’m Scottish! The nation that deep fries pizza! I’ll skip the donut burger, but I’m all about the frosted carrot. Happy birthday Queen of the Pasta! Aw, the Luther Burger. Well known in some (grease laden) circles. The first time I ever heard of deep-fried candy bars was when a coworker made them for us. Colleagues – the source of so many empty calories. I feel faint! But happy birthday! Ha, it’s the donut ham hamburger! Ever listen to Jim Gaffigan? He was making a joke about that a few years ago and then one of the ball parks started actually making the things. Ew. Sounds like your co-workers are nice folks. It’s a shame that they can’t leave well enough alone. The cake looks so good. Sadly, I cannot say the same for the donut burger. Did your boss like it? Or did he have a coronary before he could give an opinion? I’m so slow I didn’t catch on that yesterday was your Birthday lol, sorry and happy Birthday. Boy those burgers looked gross yet for some reason I found myself wanting to taste one lol. I’ve never been a krispy kreme fan either or even a burger person. Maybe it’s the drippy egg yoke at the top with all the donut glaze around it that has me interested. I’ve always been a fan of the mcgriddle (or use to be) so it’s something to do with savory and sweet together. Anyway, I need to stop thinking about it lol. Glad you decided to pass it up for the carrot cake which looked cute with it’s shredded carrots on top. That burger ought to have a warning label from the Surgeon General. So, is this an original recipe or did they just come up with this on a whim? I haven’t Googled to see if this is common practice in break rooms. I have never heard of such a thing! I love burgers but this very scary doughnut burger does not even tempt me. It sounds yucky. I am not really a doughnut person. 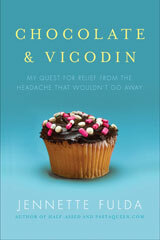 Its funny to me how we can take something unhealthy and still push it to a whole new level of unhealthy. Yikes! Glad you did not take part in this one. I can feel my heart skipping a beat just looking at that photo of the donut burger. You workplace sounds like my last job. It was a great place to work, but everyone’s day center around lunch and goodies, it is really hard to watch your weight. Disgusting yet still tempting. I amaze myself sometimes. This is so funny! 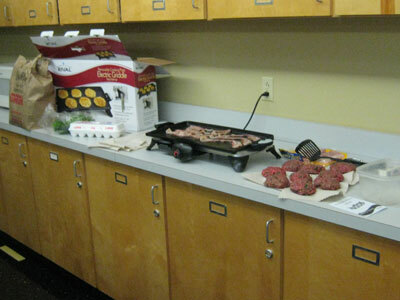 I can’t imagine frying bacon and burgers at my company – people would freak out. I think this would be really good with sausage instead of hamburger. You know how McDonald’s has those syrupy griddle sandwiches, with the pancakes as the bread? You’d get the whole sweet/salty thing going. Oh brother! Scary that I actually thought this sounded good! And I don’t even eat hamburgers anymore! But carrot cake…mmmmmmmm!! I gained a few pounds looking at the picture! Just the though of that donut burger has my stomach doing backflips. There’s a donut place near my work that serves breakfast sandwiches (sausage, bacon, ham, and/or egg) on a plain unfrosted donut. I was desperate for a sausage biscuit one time and tried it, but it was gross. I’m just not a friend of the whole McGriddle trend, I guess. Birthday cake looks scrumptious. Many happy returns! Your office has a well-equipped kitchen: electric griddle? Wow. I haven’t seen one of those in manymany years, let alone in an office kitchen. I seriously had a little pain in my chest looking at that burger. Although, I think the Krispy Kreme take on the classic egg in a hole looks kinda tasty–without the meat and cheese. One donut and one egg–maybe for a relaxed Saturday brunch after a long run, right? Okay, so I had to add up the nutritional value (I use MyFoodDiary.com) to see what the damage would be. Two donuts, one egg, 1/4 lb. burger, 1 slice of cheddar, and two slices of bacon. The picture looked like there was a THICK slice of cheese and I am not sure if those patties were only 1/4 lb. Hopefully you didn’t need any extra oil or butter in your cooking! looks interesting! Based on the above nutrition info…i’ll take 2 please! haha. jk. I’m new to the site…i love it. Oh My Gawd! I was NOT expecting to see instructions on How To Have a Heart Attack in One Easy Step when I saw you had a new post up today. Seriously! The calories and fat on that bad boy is just insane. I’m glad to see that you kept your senses and didn’t indulge in such wanton gluttony. @Flora – Someone brought the griddle in just for this experiment. I’m surprised that McDonald’s hasn’t come up with the donut bacon-cheeseburger. The New York Times once ran an article about executives in large restaurant chains (like Applebees) and basically, the way to get ahead in a big restaurant chain is to invent new ways to inject more fat and sugar into the menu. This one woman made vice president when she invented cheesecake waffles: griddle-fried dough filled with cheesecake and topped with syrup. Why not just serve guests a stick of butter covered in deep-friend cake batter and topped with whipped cream and chocoloate sauce? Say, check your RSS feeds. I came by because I hadn’t gotten an update in my reader since just after your server crash and found lots of new posts and no RSS goodness. Missed you! I would have tried a bite (sans the egg, I hate eggs), I’m curious like that. But I’m pretty sure it would have just been way too disgustingly greasy to eat. Again, happy birthday! Happy Belated Birthday! And thank you for not eating one of those burgers. I have read of Paula Dean making those, but never seen one in “real life.” I’ll take my Krispy Kremes sans sirloin, thank you very much. Your carrot cake looks lovely. And, hey! I just got an email from the USPS–while I’m on your blog!–that your stevia was delivered. Hope you enjoy. I gotta say, that picture turned my stomach. How anyone can eat that is beyond me. It’s completely, utterly GROSS. Oh.My.GOD! That is the most disgusting thing I have ever seen. And man would’ t love to eat that stuff, too. Way to go on not eating that heart attack on a plate my friend. BTW, I used to work in a place like that. I still WORK there but the guy who did all the cooking and insane things like that (we had a PORK LOIN cooking in our kitchen once) has since passed on. this reminds me of something I ate in Morocco, loved it so much I tried to make it a home. Ground meat in spicy sauce inside flaky pastry, then dusted with sugar…oh, so good, and much prettier than the donut burger! Oh, and happy birthday! Happy Birthday Pastaqueen! You are the best! Thanks for blogging, I always look forward to your next post. Thanks also for permanently turning me off to Krispy Kreme! Chocolate covered bacon…by chance was this discussion prompted by someone watching ‘Unwrapped’ on Monday night? I’m so glad that does not sound appealing to me. It must be so hard to stay away from things like that at work. The carrot cake looks great – I’ll definitely take a slice of that – the more carrot slivers the better. Carrot cake is healthy, right? There is a minor league baseball team the St. Louis Grizzlies that serves krispy kreme donut burgers at their stadium. I was horrified then and I am horrified now, but the fried egg is a nice touch they don’t have that at the ballpark. Woah! Just delurking to say I was 28 on Monday too. What are the chances? Not quite as bad as the Krispy Kreme Cheesecake. I can’t believe I am writing this but that donut burger looks good. But did they say what it tasted like? There are really no other comments I can make. Eww. Just yuck. I mean, I like an occasional donut now and then, and who doesn’t like cheeseburgers (well, except vegetarians), but really? This is just a heart attach waiting to happen. It looks so unappealing to me. And we wonder why we have a growing obesity epidemic in America? Sheesh! I’m SO GLAD you didn’t eat it. Your carrot birthday cake looks so much better. Lordy. 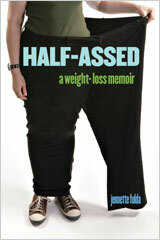 I am a fat chick who loves to eat and I would not touch that thing with a ten foot poll. Donut burgers at work! Craziness. Um. Chocolate covered Bacon? Was someone watching the food network’s dinner impossible about two weeks ago? I saw that one, the guy (Symon) put bacon in a fudge machine and whalla, chocolate covered bacon. I wanted a piece immediately. 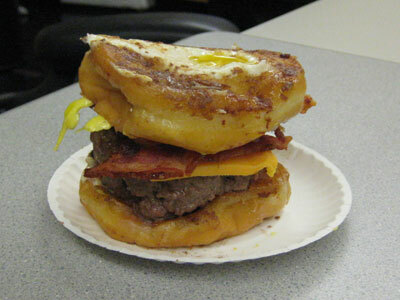 And, I have been telling my family for years that the donut hamburger would be the most amazing feat of food confection. I WILL make it one day.